The plant-buying frenzy is about to begin, and there’s no better place for one-of-a-kind plants and great gardening advice than a public garden’s plant sale. Besides, the sales generate significant income for botanic gardens, arboreta and plant societies. There’s a month-long series of sales throughout the Midwest. Many feature auctions, pre-sale party nights, workshops and book signings. To get first dibs on plants, check out the pre-sale events typically offered to members. No doubt, the membership privilege is well worth the $25-$50 annual dues. Also, come with questions. Many of the volunteers have first-hand experience growing the plants for sale. So, don’t be afraid to ask for their favorite tomato plant, native shade tree or miniature varieties. The only danger is you may end up with a trunk full of wonderful plants. “If you don’t like peas, it is probably because you have not had them fresh. It is the difference between reading a great book and reading the summary on the back” ― Lemony Snicket, Shouldn’t You Be in School? My childhood perception of peas was based on peas out of a can: mushy, tasteless, army-green-colored excuse for food. My dad had a garden, but it was filled with tomatoes, carrots and lettuce. I’m betting peas were absent because they needed to be started early, and that just didn’t fit into my dad’s schedule. In college I helped shuck peas and discovered their true flavor and texture. What a revelation. I don’t plant peas every year, but when it fits in my schedule, peas are my food-harbingers of spring and early summer harvests. Their only competitor is asparagus, but that is a post for another day. When do you plant peas? The rule of thumb is to plant them as early as you can work the soil starting in mid-March; St. Patrick’s Day is often given as a target date. My target range is closer to April 5th to April 15th which is when I can get into the garden. Right now my peas are about one to two inches tall. 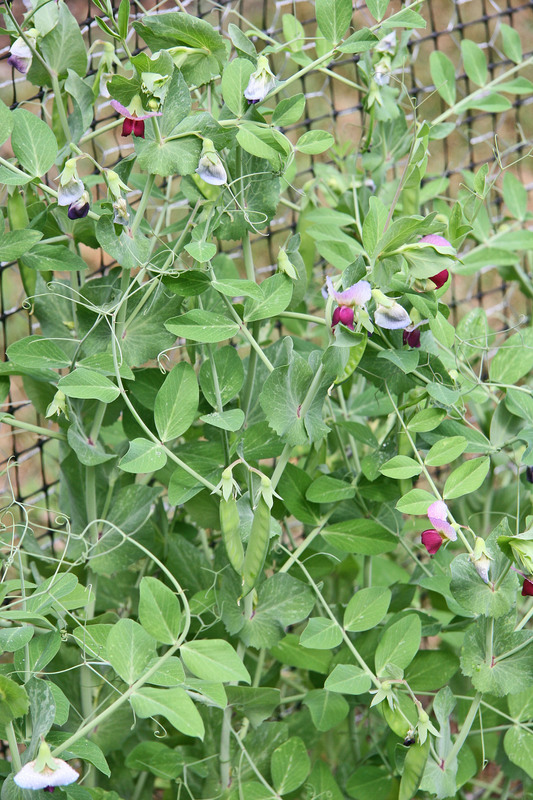 I am impatient and don’t usually plant peas that need to mature and be shucked. I gravitate towards the snow and snap pea cultivars which are delicious in their raw state or when lightly sautéed or stir-fried. I confess to using frozen peas in recipes that call for the “seed” (pea) instead of the “fruit” (pea-pod). At a restaurant I had an elegant appetizer that consisted of a pea and mint pesto spread over baked ricotta. I have yet to replicate it; maybe this year. In a food processor, combine the above ingredients. Sauté the peapods in the olive oil until they are bright green and tender-crisp. Toss the pesto and peapods with six to eight ounces of your favorite pasta. Garnish with toasted pine nuts or pistachios. You may wish to dress with one tablespoon of high quality olive oil. A fantastic olive oil – available online – is Lucero Meyer Lemon infused olive oil. A pair of bald eagles is nesting in the Big Apple for the first time in over 200 years, according to the Associated Press story. Rachel Carson would be so pleased with this news. The eagles are incubating at least one egg on a treetop nest on the south shore of Staten Island, the city’s most suburban borough. Almost as amazing, bald eagles were spotted this year in the other four boroughs, which includes skyscraper-covered Manhattan. Not bad considering the entire state had no eagles by the 1960s. 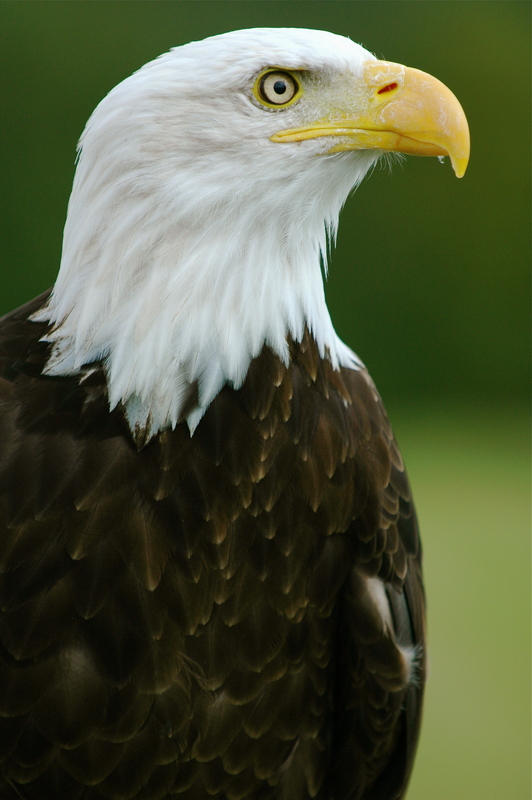 Eagle populations across the country had declined so much that the national bird was declared an endangered species in 1978. Last year there were 254 nesting pairs in New York state. 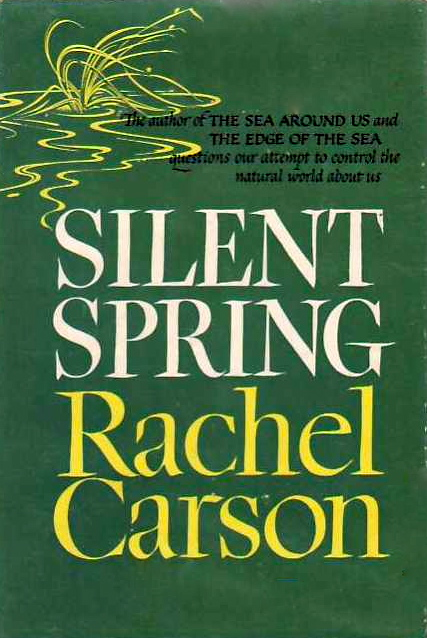 Silent Spring, Carson’s 1962 book, documented DDT’s threats to eagles, other wildlife and people. I’ve always considered Carson, who died from cancer in 1964, as the silent spirit behind the first Earth Day in 1970. Her’s was hardly the only cry of alarm about what people were doing to the planet, but her passion, coupled with solid documentation, made it hard to ignore. Carson had a lonely vigil for a few years until popular thinking changed. Our planet is still in danger from what seems a never-ending list of ills. But this report of eagles nesting in New York gives hope. 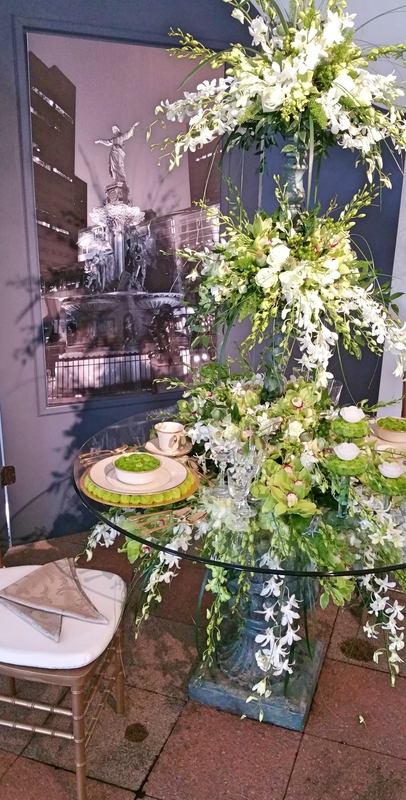 From fabulous table settings to window boxes to jaw-dropping display gardens, the Cincinnati Flower Show’s long awaited rebirth in a new venue won’t disappoint. The horticultural magic is as powerful as ever. Set in white-tented splendor in a downtown riverfront park, the show blossoms between the wide, brown Ohio River and condo and office towers. The colorful oasis caused our jaws to drop more than once as we wandered Tuesday morning with wonderful hosts Kevin O’Dell and Marie Huenefeld. The event opens today and runs through Sunday, April 19. 1. Cincinnati landmarks interpreted in elegant table settings. For instance, Fountain Square suggested in frothy, white orchids spilling from a multi-tier container. The focal point in this tent is a small dining table with crystal chandelier overhead that looks like a magazine cover shot. 2. 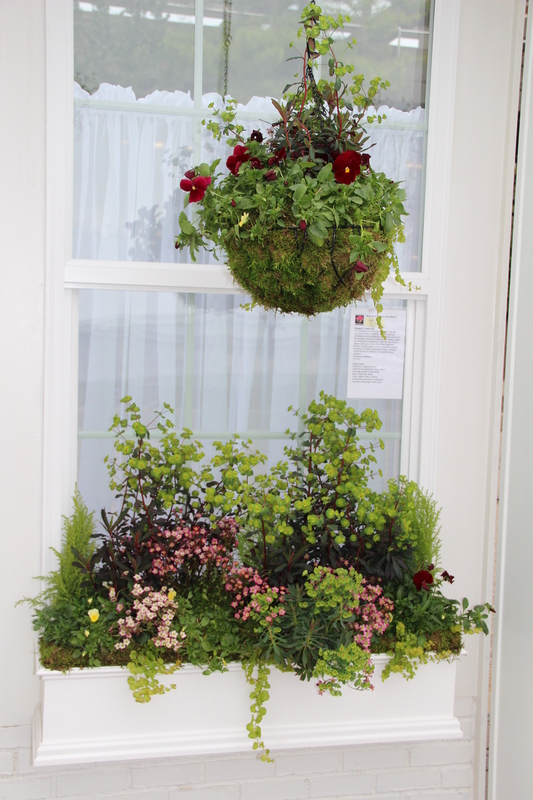 Less elaborate but no less appealing are the window boxes and hanging baskets played out in visually appealing — and practical — combos of plants. In the same vein are containers and miniature gardens. 3. Shopping is back, too. 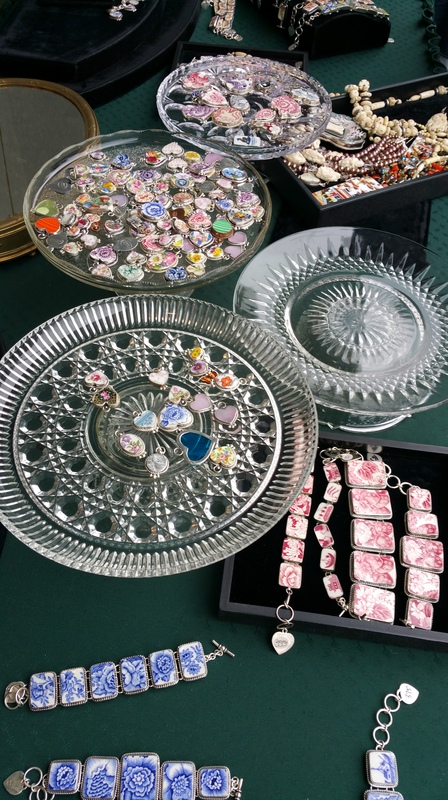 Be sure to check out Vintage Revival’s jewelry from beloved china patterns. And of course you can buy plants of the most unusual nature and favorites, too. We also spotted a different take on garden flamingos — a small stone for the body, and black wrought metal outlining legs, neck and head. Not for everyone, but they brought a smile. 4. Display gardens in all sizes and styles, from a penthouse terrace to a Findlay Market of yesteryear, complete with antique wooden boxes, bare, clear light bulbs and seedings in tiny peat pots. 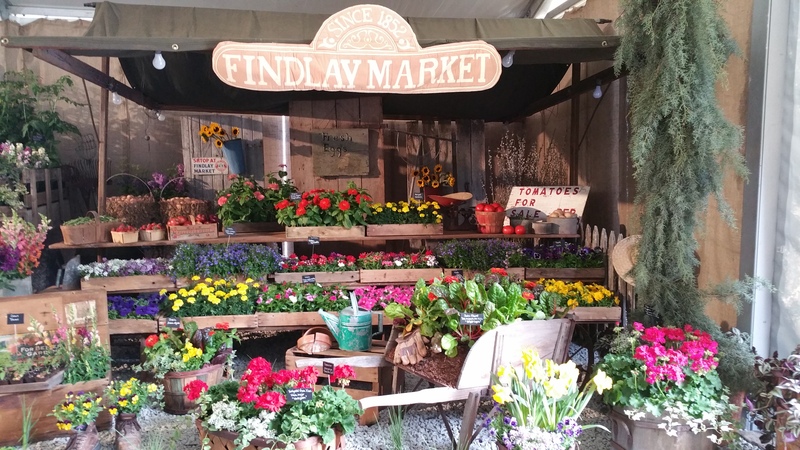 One tent features display gardens created by Cincinnati horticultural stops including world renown Spring Grove Cemetery, which shows off some of the plants it has introduced to the horticultural market. 5. 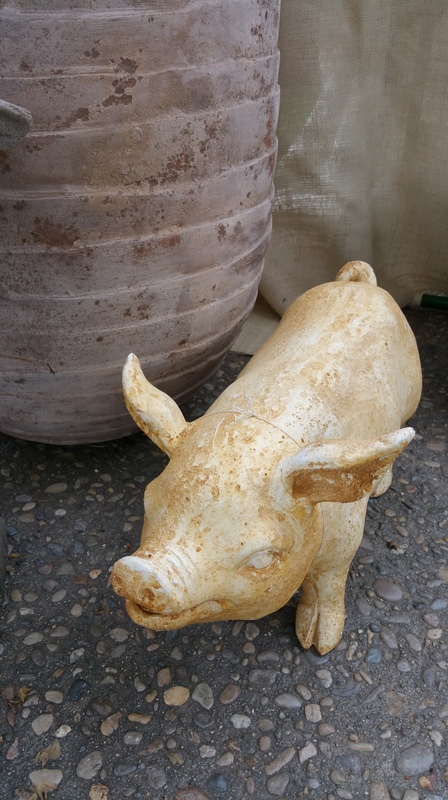 Pigs flying and otherwise can be found in all shapes and sizes, a natural for a city once nicknamed Porkopolis due to the number of slaughter houses. See if the kids can count all the pigs they see. 6. 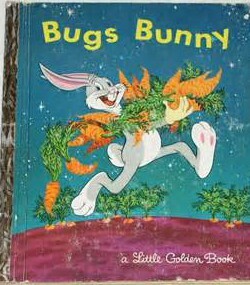 Children will find programs just for them and planting opportunities. 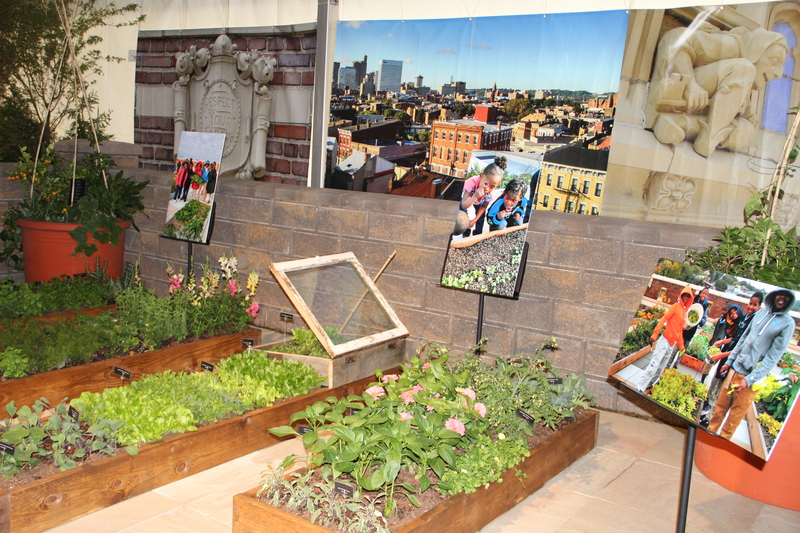 There’s a display inspired by a rooftop garden at school near the heart of town. 7. 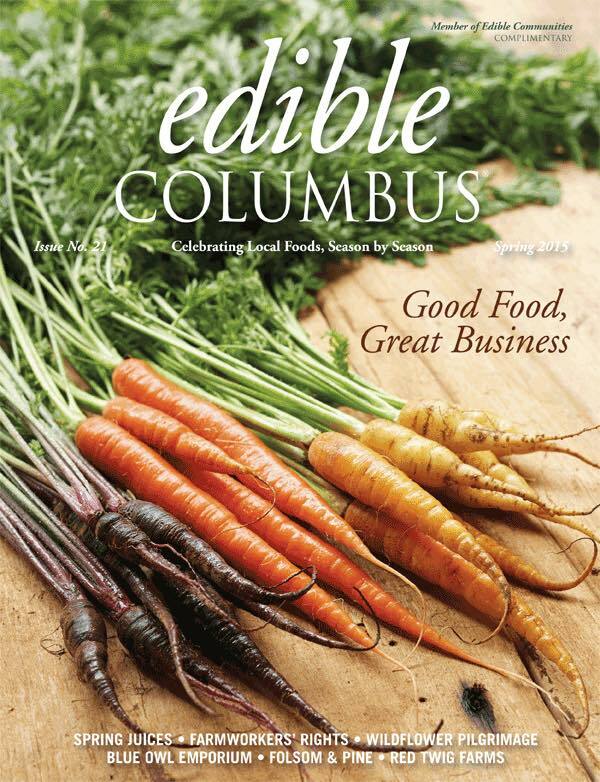 Plenty of learning opportunities with guest speakers including P. Allen Smith and Jon Carloftis. 8. 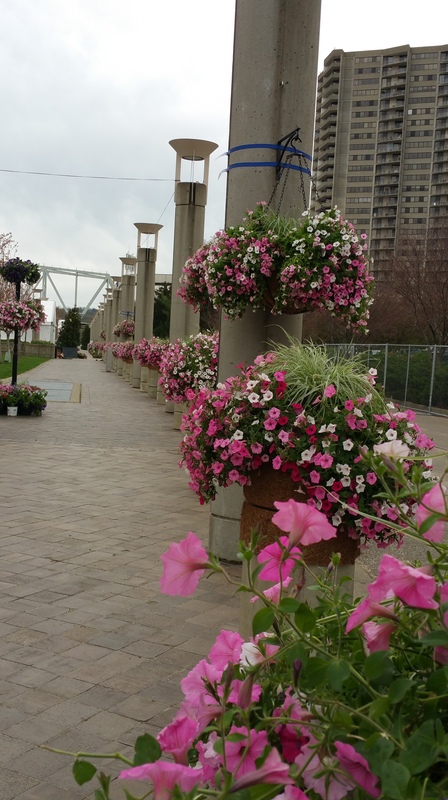 Impossible to miss are really big containers of pink petunias hanging from poles and sitting atop posts. 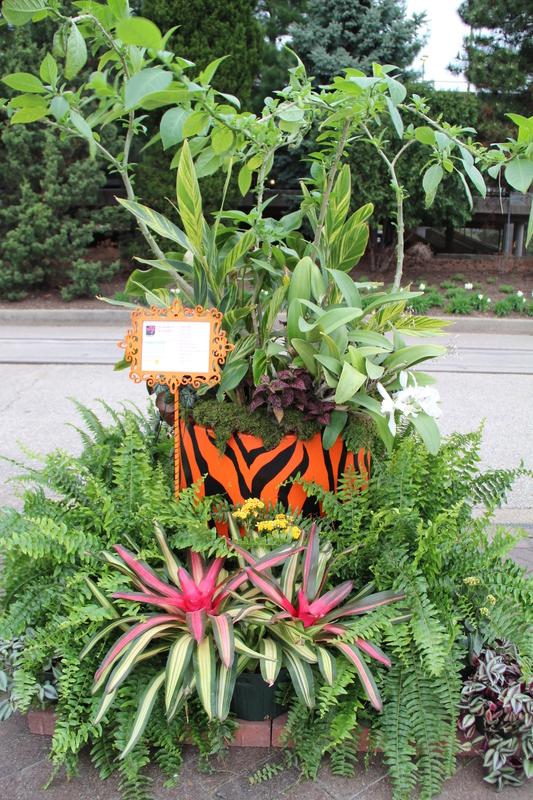 These plants, donated by Proven Winners, give the park a festive, party atmosphere. 9. 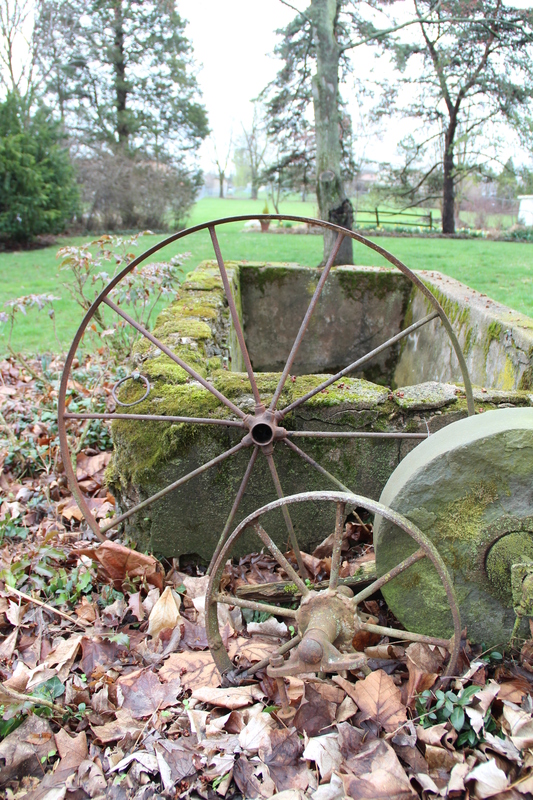 Inspiring garden ideas including our host’s own garden design. 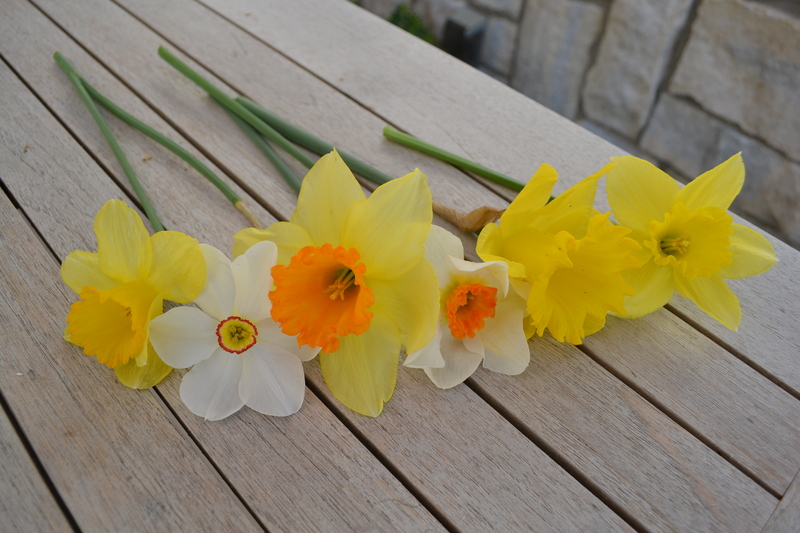 Easy-growing daffodils bring smiles of delight each spring. 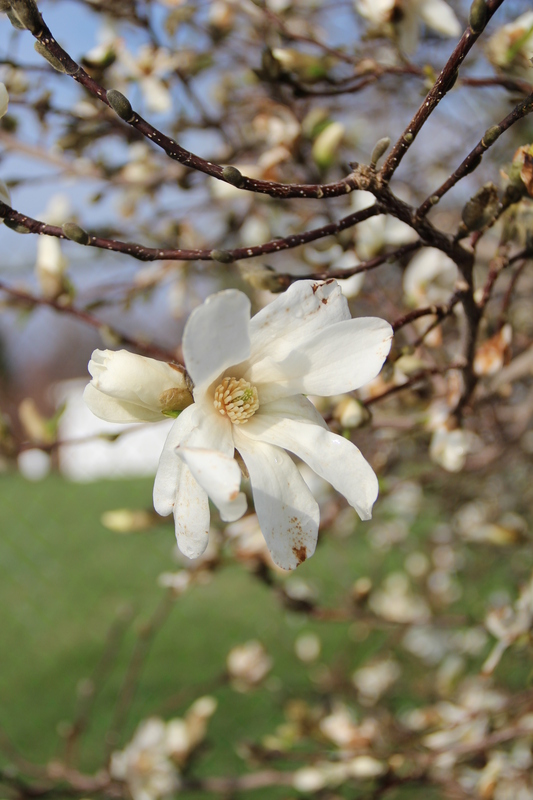 To ensure the best chances of success with these poet-inspiring flowers, we offer suggestions from the Buckeye Yard & Garden onLine produced online by Ohio State University Extension. * While adaptable to a range of conditions, some places won’t work. If you have heavy shade, try early blooming varieties. 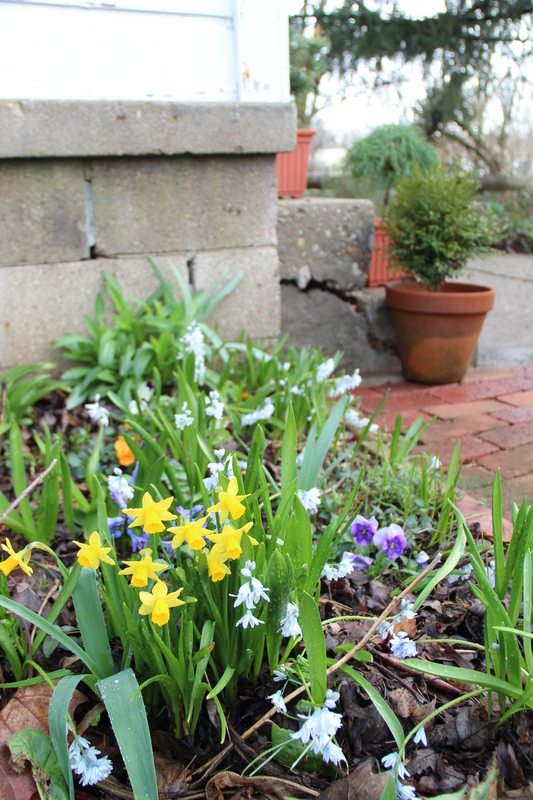 If you have wet soil, don’t plan on daffs. Good drainage is essential. 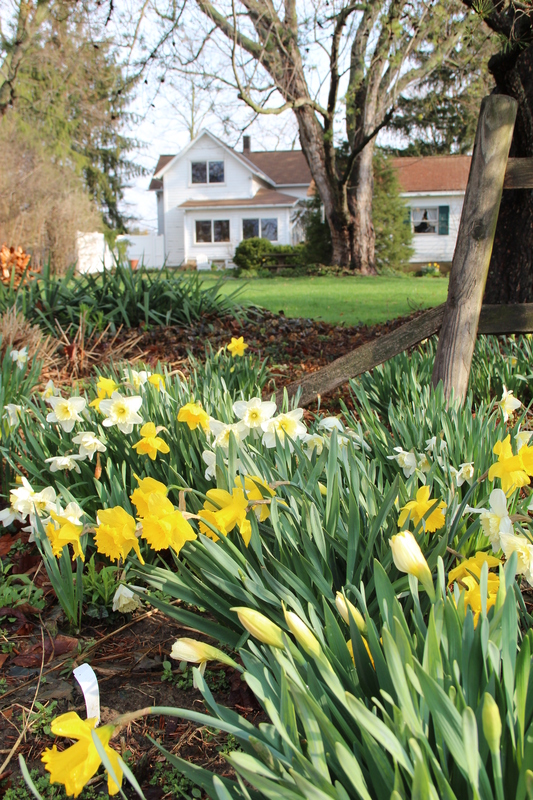 * Apply bulb fertilizer in early spring as foliage begins to emerge. Too late for this year, but do this next if you like. 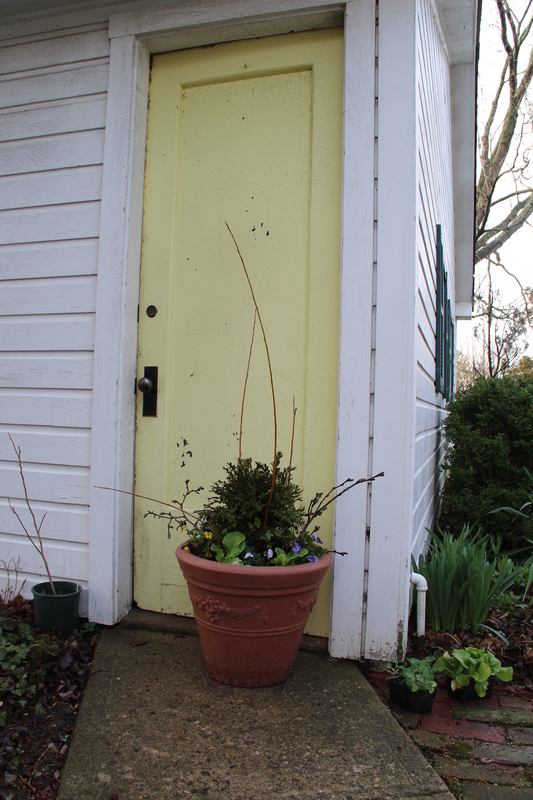 * Skip the folding, braiding and tormenting of foliage after flowers fade. The more leaf surface exposed to sunlight, the more food the bulb produces to power next year’s show. 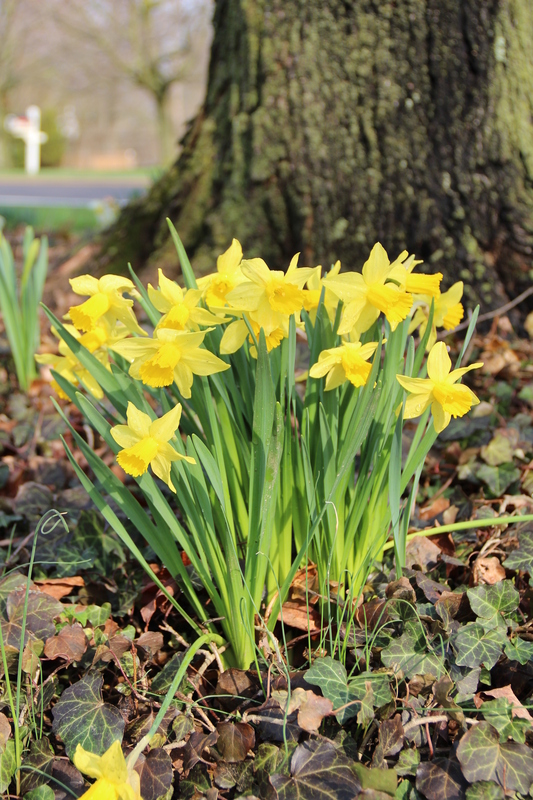 If fading foliage offends, interplant bulbs with perennials that will begin growing later in the spring and hide the yellowing daff leaves. 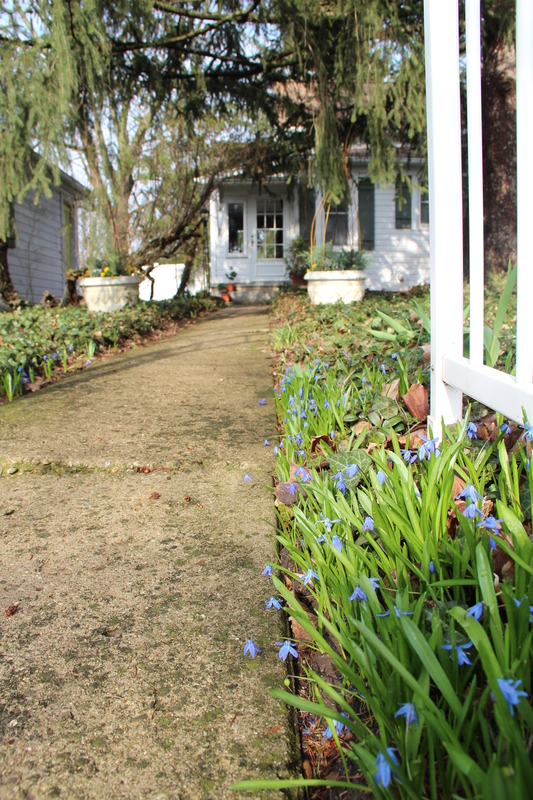 Our fellow blogger Michael Leach definitely has a green thumb, and his gardening efforts this month are showing some golden results! 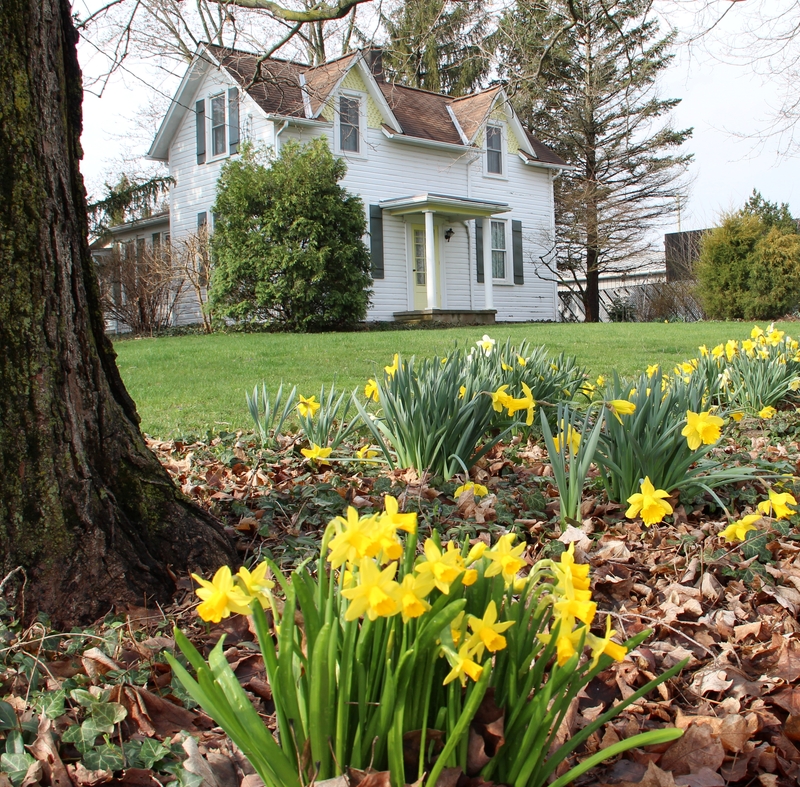 At his home southwest of Columbus, Michael planted hundreds of daffodils around the family farmhouse where he grew up as a child and returned in 1988 to make his own and transform the gardens. 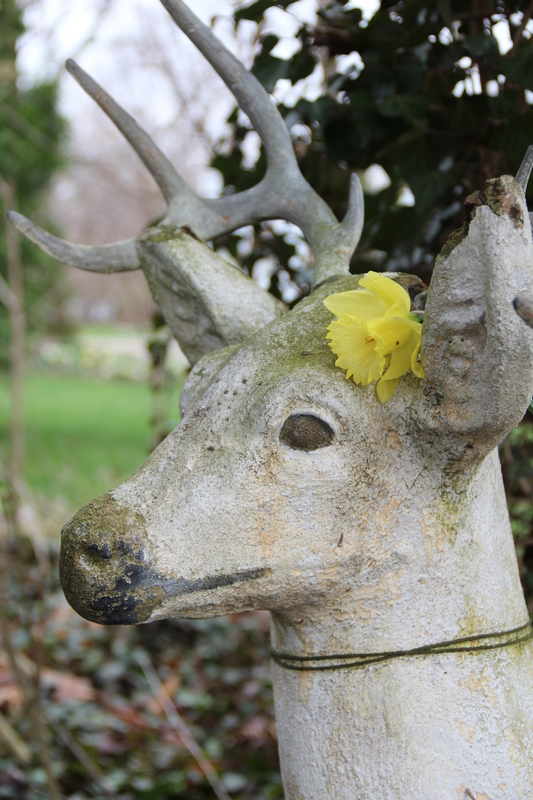 Check out these recent snapshots of his spring paradise. 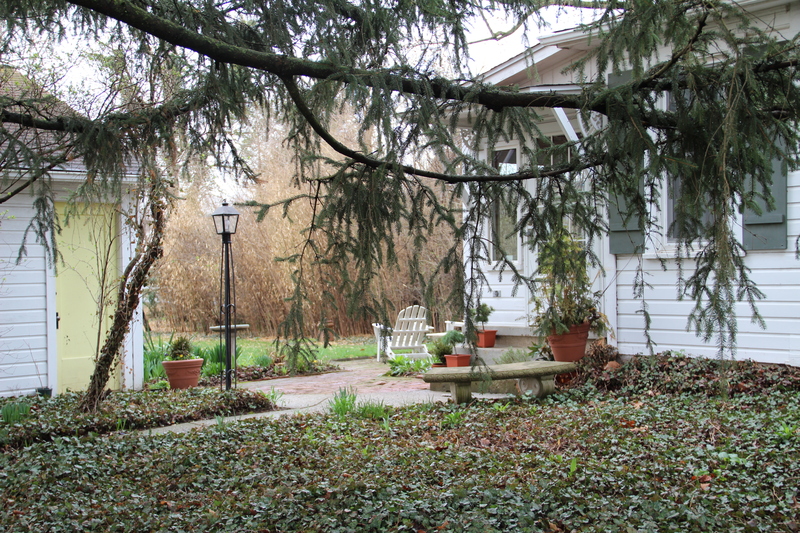 Century-old maple trees were planted by Michael’s uncles who built the home in 1890. 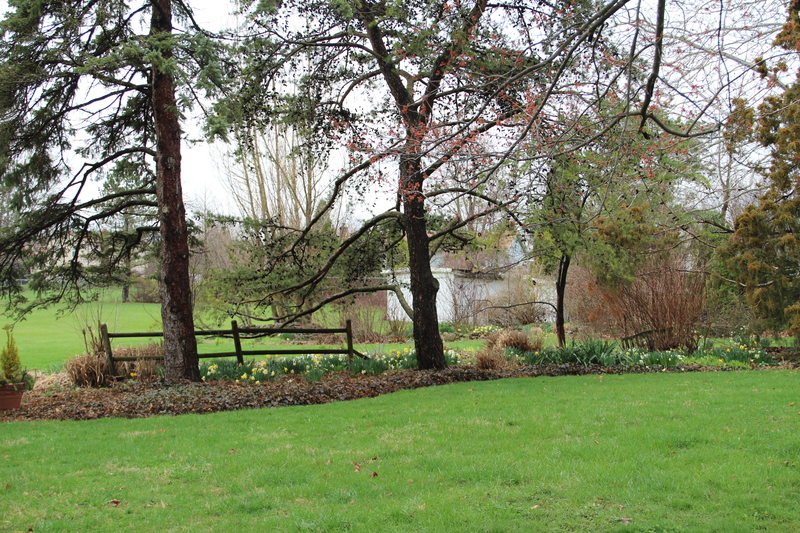 More daffodils frame the rear view of Michael’s property. Thanks for sharing your garden, Michael! In my part of the Midwest, planting potatoes, peas and other cold-tolerant vegetables on St. Patrick’s Day is a garden tradition best kept in the breaking. Usually, it’s way too cold and wet. So imagine my delight from digging potatoes and snipping a few tiny, tender collard and Asian greens on St. Patrick’s Day. Some of you probably have even better harvests to brag about, after all, bragging is a somewhat shameful but timeless element of gardening. I suspect one reason agriculture caught on with our paleo-forefathers may have been one-upping each other on the size and flavor of prehistoric veggies. Flowers might have factored in as well, assuming our paleo-foremothers were as delighted with a bunch of blossoms in a man’s hands as many women are today. Times change but not bragging rights. Producing the first tomato of the summer prompts incredible antics by some growers: choosing Early Girl or other can’t-wait-to-set-fruit varieties, coddling seedlings under grow lights, using mini greenhouses, and muttering mystical chants passed down from those first gardeners. Enough about chest thumping. In the case of my potatoes, they aren’t the first of the season but the last of last season. Being lazy, I skipped the excavation. I even skipped digging potatoes, which don’t keep very long in my cellar. Instead, mulch was piled thickly over the potato bed. A lot more mulch was needed this bitter winter — about half the potatoes dug St. Patrick’s Day were partly to totally mushy. The rest, however, are unscathed and delicious, as only home-grown Yukon Golds can be. The collard greens were sown Aug. 15 and grew to micro-green size before serious cold weather arrived in early November. Immediately after seed planting, I secured floating row covers over the beds. Designed to thwart insects from accessing the greens, the row covers serve as something of a windbreak. I discovered this by accident a few years ago when I was too lazy to remove it after winter arrived. Even in the horrid winter of 2014, I picked a few leaves of collards and kale on St. Patrick’s Day. In milder winters, various greens can be picked all season, though growth slows to zip from mid-November to mid-February. Besides greens, I discovered the carrots, planted in late summer (tag is missing), came through just fine under the row cover. A couple dug on March 30 were sweet and crisp. OK, that’s my story. What’s yours? Surely someone can top all this. 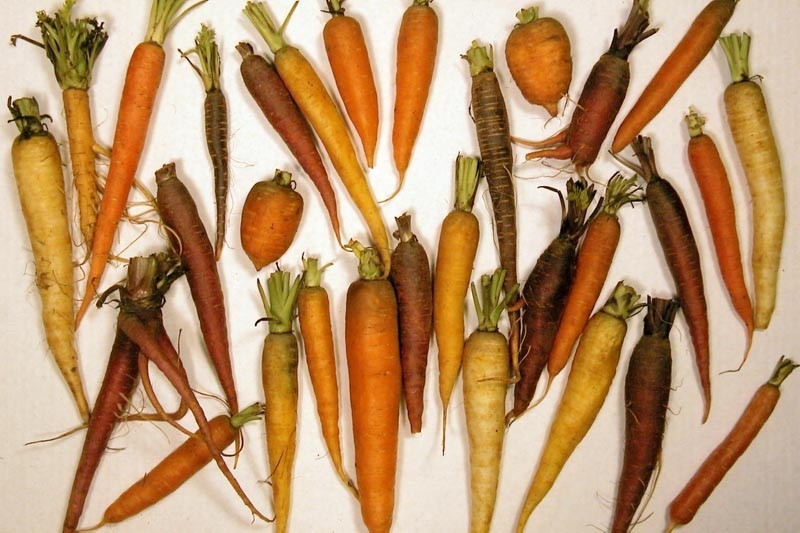 For more inspiration about year-round harvests check out www.fourseasonfarm.com, site of Eliot Coleman’s Maine vegetable farm that uses no heated greenhouses.